Ahhhhh… October, the best month of the year! Ok I’m a little biased because I happen to be an October baby. That aside, many exciting things happen in October: Oktoberfest, Halloween, My birthday (sorry I had to), and of course: Pink October for Breast Cancer awareness. Did you know that 1 in 8 Women will be diagnosed with Breast Cancer in their lifetime? That piece of statistic is scarily high! And if you have any family member with history of breast cancer, your chance of developing it goes up exponentially. The key is to remember to self-examine regularly and if you do find any suspicious changes, head over to your nearest family doctor. Leading a healthy lifestyle can help reduce your risk of developing cancer too, and pretty much any illness really. To read more about Breast Cancer, head over to http://www.nationalbreastcancer.org/. 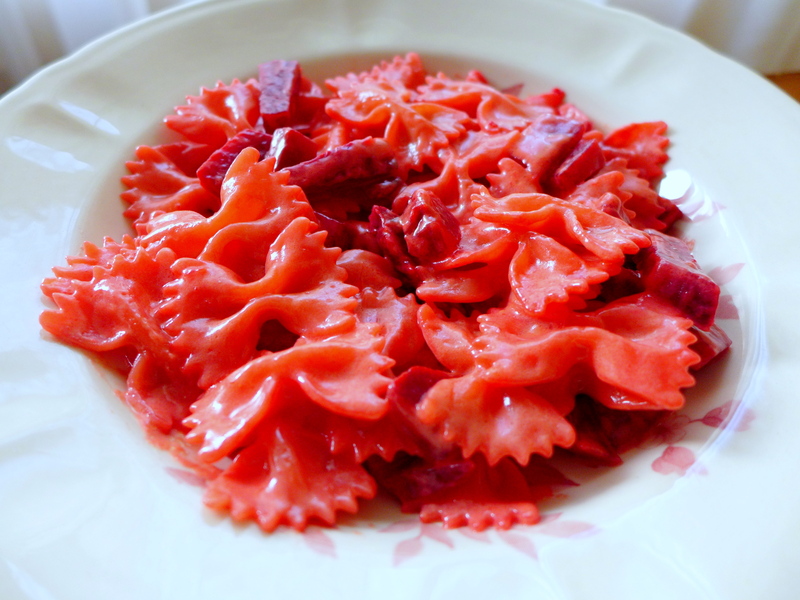 Just your ordinary Farfalle pasta. Amazing, isn’t it? Beetroot is also good for you in many other ways: it’s an excellent source of folate as well as manganese. It also has blood pressure lowering properties, thus reducing the risk of cardiovascular disease and stroke. It’s also said to be performance enhancing due to the high amount of nitrate. Although you might get a little concerned after consuming beetroot as the crimson red compound does not break down in our body, which means…. well it’s not blood in your you-know-what. This recipe is inspired by Not Quite Nigella, though I have changed it to suit our lifestyle. That’s right, it’s vegetarian. And it’s pretty simple too. You just have to allow an extra hour to roast the beetroot. Wrap the Beetroot in foil and bake in 180C oven for 1 hour or until tender. Let cool, peel the skin and chop into chunks. 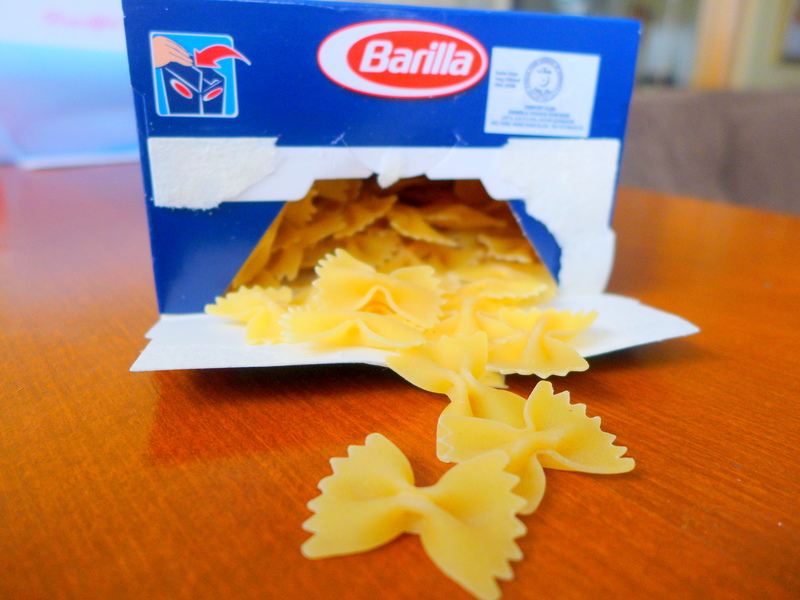 Cook pasta according to packet instructions in salted boiling water until al dente. Meanwhile, heat a tablespoon of olive oil in pan and add garlic to saute until fragrant. Add all the beetroot chunks, followed by cream. Stir until the cream turn magenta pink, dilute with pasta water if needed. Season with salt and pepper. 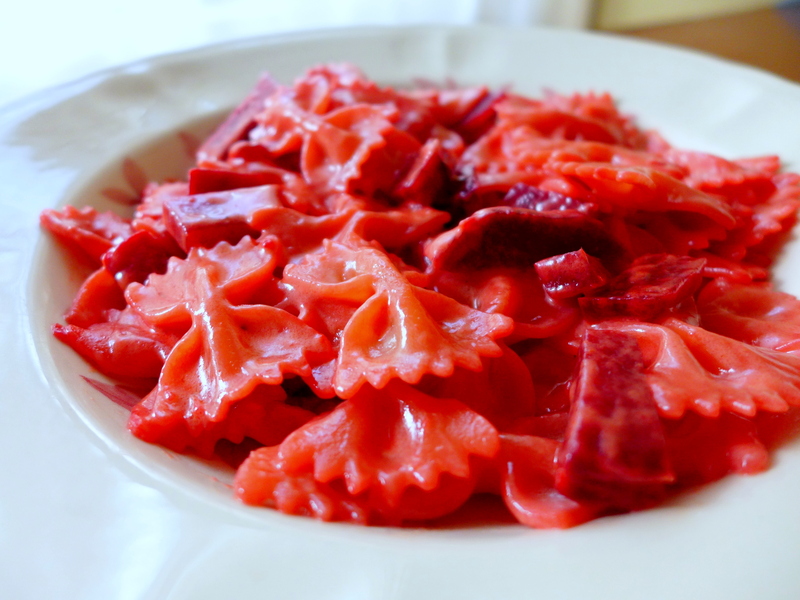 Once the pasta is cooked, drain (reserving some pasta water if needed) and add to the beetroot/cream mixture, stir in the parmesan cheese, then stir until the colour is evenly pink. Serve hot. Intimidating? Or intriguing? You be the judge. Frank is a huge fan of beetroot (read: I have made this dish quite a few times) and thus wasn’t put off by the bright colour. Your bf/husband might need a little convincing. Haha. If you have never tasted beetroot before, it’s slightly sweet, with earthy flavour. The texture is quite tender when baked (although you can also have it pickled or raw, then the sweetness won’t be as pronounced). In this dish, the sweetness is balanced by the salty parmesan cheese. It’s not overly creamy as the mixture should just be enough to coat the pasta with no excess. 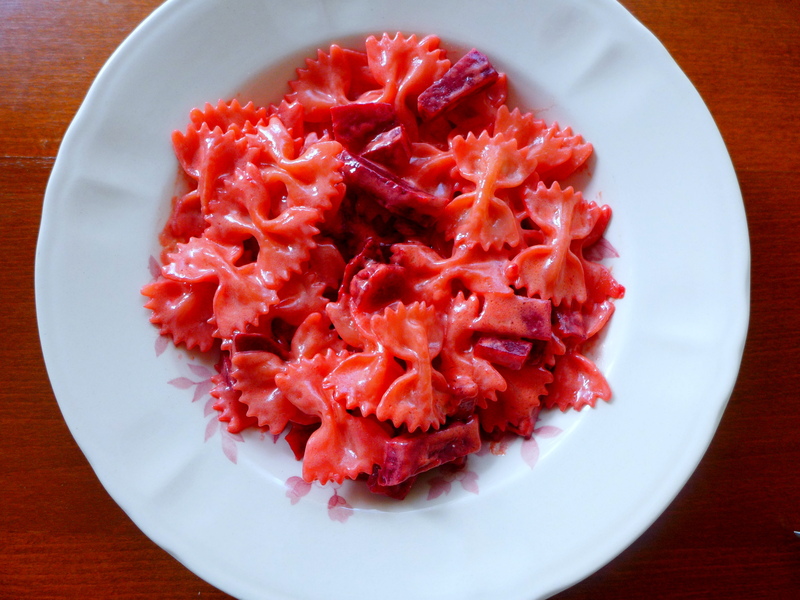 If you think that roasting one beetroot at a time is rather silly, you can always roast a bigger batch and use them in other dishes (salads, sandwich filling, more pasta, endless possibilities). Might as well turn my blog pink for the month too! Beetroot? Can’t get that here. Tried it in NZ, nice! Hehe. Can always make again! Easy peasy! I’m a huge beetroot fan. I love it with some blue cheese too. Yeah some gorgonzola would be lovely with this. Hahaha it is actually pretty simple la. I didn’t come up with this on my own, just changed a few things from another recipe. Very pretty pasta and very cool concept too! I didn’t know it was beetroot from just looking at the pictures. Yeah, it’s something that *really* stains! I used it with (a small amount) of nectarines and pureed it for a poached chicken breast that I learned from an episode of MasterClass. 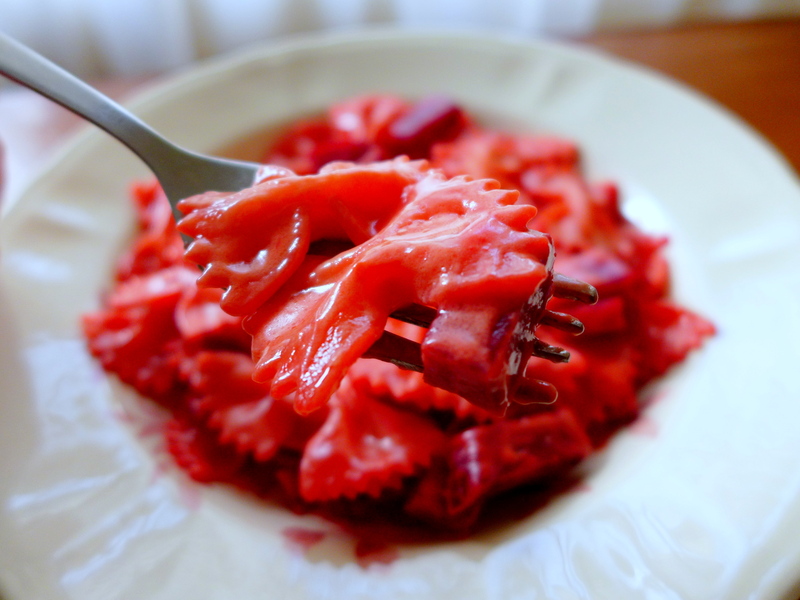 I like beetroot too and this pasta looks good with just burnt butter!